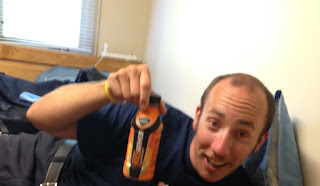 Welcome To ColleenRichman.com: Get Superior Hydration With BodyArmor! Get Superior Hydration With BodyArmor! BODYARMOR is a sports drink that keeps you hydrated while supplying your body with all natural vitamins and electrolytes. Used by pro athletes, parents, and many others alike this sports drink offers the benefits of a healthy nutritional drink to keep you hydrated without any artificial flavors or fillers. BODYARMOR is a must in this house! Buying these is super easy because they are carried locally at Kroger, Food Lion & Walmart in Richmond! They come in a variety of flavors so you're sure to find something that fits your taste! These drinks are perfect for your summer activities, sports, at the gym, and travel! It's a great way to stay hydrated if you have an active job, especially outdoors in the heat! This fireman is sure enjoying his orange mango flavored BODYARMOR drink after a long day of training at the firehouse. Be sure to click the link below and order yours today!